Loose Meat Sandwich on Pita Bread! Now let's go make this Loose meat Sandwich on Pita Bread! Mix salt (or salt substitute), freshly ground, mixed pepper corns and garlic into the meat. Fry the minced celery and diced onion in oil just until the onion begins to look glossy (stirring regularly). Add the meat and fry only until is almost cooked (stirring regularly). Sprinkle in paprika until meat takes on a slightly reddish hue. Add mushroom and tomato cubes and continue to fry just until the meat is cooked (stirring regularly). Take meat off heat. Stir in onion slices and set aside for later use. 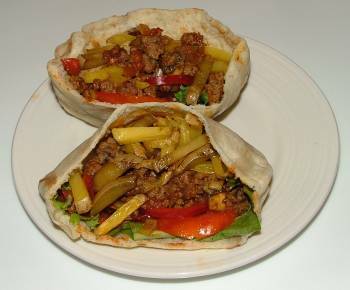 Cut the pita in half and, in each half, lay in some lettuce, tomato slices and sweet peppers. Fill each half with the meat mixture and add potato to taste. Of course, now that you know how to make Loose Meat Sandwiches on Pita, you can click here for the perfect, easiest recipe for pita pockets! The Loose Meat Sandwich Reminder: This is how we made our most recent Loose Meat on Pita sandwich but anything goes. It's your sandwich and it has to fit your taste so have an adventure. Make yourself happy and assemble your sandwich the way you like! This is a simple recipe mostly because it is so incredibly flexible that anything you do is right (so long as you like the way it tastes). It can be a bit of work to prepare but it's not hard work and there's pretty much nothing you can do wrong ... because anything you like will work well. Loose meat is essentially a ground meat sandwich where the meat is not formed. Rather, it is just "loose". What differentiates this from Sloppy Joes is that the Sloppy Joe has a sauce while the loose Meat Sandwich, while it should be nice and juicy and moist, is not made with a sauce. This being the case, a nice home made pita pocket becomes the perfect bread choice to enjoy this kind of sandwich. While we may not always make it exactly the way it's done here, this is a nice preparation. It's moist and flavourful - rich and juicy with flavours and textures from mushroom and tomato pieces cooked right into the meat; and refreshing with garden-fresh lettuce, tomato slices and sweet peppers. We also like to toss some shoestring french fried potatoes in there. This sandwich becomes an entire, satisfying meal in a pita pocket.